Mindfulness Works – Find the time and reap the benefits. Mindfulness: a mental state achieved by focusing one’s awareness on the present moment, while calmly acknowledging and accepting one’s feelings, thoughts, and bodily sensations; used as a therapeutic technique. 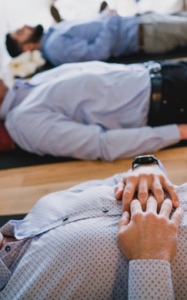 Though it has its roots in Buddhist meditation, a secular practice of mindfulness has entered the mainstream in recent years, in part through the work of Jon Kabat-Zinn and his Mindfulness-Based Stress Reduction (MBSR) program, which he launched at the University of Massachusetts Medical School in 1979. Anne Krog Iversen is the Chief DNA & Culture Officer, and co-founder of TimeXtender – a software leader dedicated to enabling businesses to make quality decisions with data, mind and heart by offering an innovative platform that enables self-service BI and analytics using the power of automation. Anne has been a proponent of corporate mindfulness, speaking at global conferences, and hosting remote mindfulness sessions worldwide using digital technology. Krog Iversen points out that we’re not born with the traits to be mindful, nor are we trained in school. Though the benefits have been well documented, from better health, to less stress, and more energy, it is not an instinctual part of our lives. She believes it is a new type of responsibility that should rest on the corporation. One that helps its valued stakeholders (starting with employees) become more mindful and aware when making decisions. 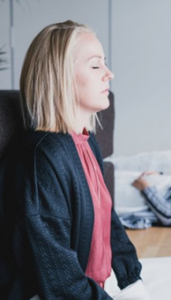 Anne Krog Iversen recently shared her insights on corporate mindfulness, with the hopes of engaging Business View Magazine readers on the subject. So, relax and listen up folks. This is an excellent way to start your 2018 on the right note. Happy New Year! Krog Iversen: I always begin meetings with a minute of silence. That’s one of the five cornerstones in DNA & Culture at TimeXtender. We have a minute glass in all our meeting rooms, and we start every meeting by turning it over, just to focus and connect with the task at hand. So, let’s start today’s talk with a minute of silence. Remember, you can do no wrong. Eyes open or closed. I’m turning the glass now, and will tell you when the time is done… Ok. One minute is up. What did you experience? BVM: I listened to the sound of my breathing. Everything else went away. That’s what I needed. Krog Iversen: That’s exactly what mindfulness is all about. Connecting to yourself, so you can do the right thing – for yourself, your team, your business, the world. In my opinion, we can’t make the right decisions if we’re stressed out, with our own agenda in mind all the time. We need to connect. That’s what we practice at TimeXtender. Because we are a global company, we have ‘X-people,’ as we call ourselves, in France, Germany, Italy, UK, North America, and we lead with a purpose because time matters. We have a lot of online meetings, as well as onsite at our headquarters in Denmark and Bellevue, Washington. BVM: Is it more difficult to relate online than physically in the same room? Krog Iversen: It needs more attention online, because sometimes you can’t see each other’s eyes. So, we need to connect to ourselves to make sure we are aware of the task at hand, who we’re talking to, what is the intention, and where are the others? In our meetings, we practice the tools of mindfulness. We use Stephen R. Covey’s The 7 Habits of Highly Effective People as a shared language, and we are all trained in those habits. As one global team with high employee standards, we choose to train both professional skills and mental skills for the benefit and well being of everybody. Being online all the time, we need to balance the Yin and the Yang. BVM: What do your employees get from the onsite mindfulness office sessions? Just imagine if she tells her boss, “I’m too busy. I can’t take the 10 minutes.” You know, we all have so many tasks to do every day. But, if we don’t reset ourselves, and pause in between, we’ll just increase our stress level. Where is the business if everybody is burned out? It’s a guided meditation. When you come out, imagine the difference in your day for yourself, your team, and your business. 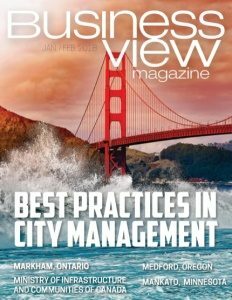 BVM: Is mindfulness a one-size-fits-all sort of discipline within a company? The Mindful Recharge is totally voluntary. But the number who follow is increasing. Now, 30 percent of all employees are participating every week. Because they see the difference in people when they come out of the session. More energized, more focused, more positive. The mindset has changed. The staff then share ideas and grow. Some take up mindfulness classes on their own. We travel a lot, and some use mindfulness apps when they’re on the move. We now also invite external partners and stakeholders to our online mindful recharge sessions, so they too can benefit. BVM: How should a company start to implement mindfulness? Do they need a DNA & Culture Officer for leadership? Krog Iversen: Not everyone is as lucky as TimeXtender to have a DNA & Culture section. Whether you’re a little start-up company, or a large, older, privately-owned business, begin with mindfulness apps, start a dialogue about it, then move on to more structured sessions. Start small and let the structure grow. Be an inspiration, yourself. Even if you’re a commercial leader, or CEO of the company. You’ll see we really need this because we’re ‘doing, doing, doing’ all the time, and we need it to make the right decisions and perform well. Of course, if it’s a big enterprise, you need to be more structured about it. BVM: How did you become involved with mindfulness in business? Krog Iversen: Six years ago, I was unlucky to get whiplash, and I found out as a company owner, I couldn’t just call in sick. I had to find a way to deal with it, and I discovered how powerful mindfulness really is. Not only to heal, but also to prevent. Top athletes have known this for a long time. They need to work on their professional and mental skills to perform at excellence every time. We need to be at our best in business, as well, and love the journey. Mindfulness is what makes the difference. As a business owner, I see it as a social responsibility. If we’re going to build a sustainable business in a world where we’re online all the time, then we need to train balance. It’s about connecting with ourselves and prioritizing our time. Just look at all the global businesses out there. So many work like freelancers with our laptops from anywhere. The problem is, if you don’t connect to yourself, if you don’t know your boundaries, you can’t say no to doing more work. Mindfulness trains you to know when you need a pause, so you can keep your balance. The 2017 hurricane season took a terrible toll. The loss was devastating in parts of Texas and Florida. In the Caribbean, many homes and businesses have been completely ruined, and electricity is still not fully restored. How can one move ahead and recover after such a life challenge? How can we make peace with the challenges we face? Despite this pain and challenge that far too many face, everybody has a choice to move forward. One choice could be to meet the near future by getting ourselves mentally prepared to stay strong, and learn to practice acceptance of ‘what is,’ whether it is good or bad we are faced with. This is where mindfulness comes into play. By learning how to settle our thoughts and minds, and develop a personal thought pattern, we can support ourselves and help tackle life’s challenges. We all have the power to change our thoughts and destiny, and one tool for this could be mindfulness. Admittedly, it won’t take away the damage that has already occurred, but it can help us see it in a different light. It can provide mental strength, optimism, and even hope for what lies ahead. It can help us build a new daily habit and a better life, a better future. Mindfulness is all about “being with what is”, and that’s a personal trait that can be taught and nurtured. Given that, TimeXtender would like to invite all Business View readers to join us during our weekly Mindful recharge sessions on Mondays at 11:50 AM PST. Here, you will be guided through the basics of mindfulness and breathing techniques. The sessions are free of charge. Click on this link to find out more and to register. We hope to see you there and send you all hope and light for the future. 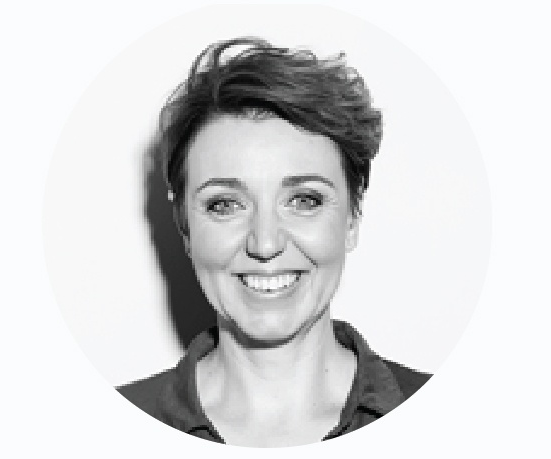 Anne is the Chief DNA & Culture Office and co-founder of TimeXtender. She has been an important part of getting the company to where it is today, since its inception in 2006. Prior to co-founding TimeXtender, Anne held positions in HR, sales and management at several other Danish companies. Anne’s passion is people and she holds certifications as a mindfulness practitioner and a life and business coach.